Even as the country prepares for the launch of Obamacare’s new entitlements tomorrow, research from the non-profit Center for Health Care Strategies reveals that millions of inmates could receive health insurance under the new entitlements. 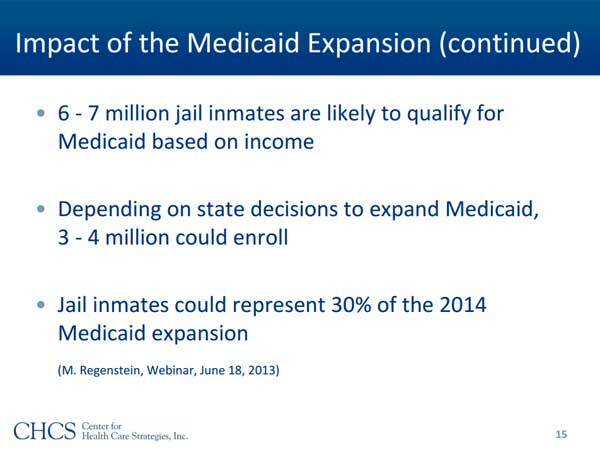 Slide 10 of the presentation, which discusses the impact of the Medicaid expansion on the criminal justice population, notes that “Medicaid can pay for inpatient treatment for inmates/detainees who would otherwise be eligible for Medicaid.” Slide 14 cites Bureau of Justice Statistics data to demonstrate that there were 11.6 million admissions to local jails during a recent 12-month period, and that “approximately 60 percent of jail inmates had pre-arrest personal income” that would allow them to qualify for Medicaid under Obamacare. As the slide deck notes, whether inmates qualify for Medicaid depends on whether states expand their Medicaid programs—and whether they receive Medicaid treatment while incarcerated depends upon whether state programs allow for Medicaid coverage of inmates. But the facts are clear—as many as 6 million to 7 million inmates could qualify for Medicaid after their incarceration, and some of these could qualify for Medicaid while serving as inmates. And if “jail inmates could represent 30% of the 2014 Medicaid expansion,” as the presentation alleges, that would represent a significant chunk of the $710 billion in spending on Obamacare’s Medicaid expansion over the next decade. The Obama administration acknowledged for the first time Thursday that a technological problem is forcing it to delay part of the rollout of the new health-care law, saying insurance exchanges won’t be ready to accept online applications from small businesses when the program launches Tuesday. With less than five days left to debug the sprawling new computer system, there are other signs of trouble: People close to the situation are also skeptical the online marketplaces for individual customers will be fully ready…. Last week, The Wall Street Journal reported that the software supporting exchanges for individual consumers that the federal government is running on behalf of 36 states was miscalculating U.S. subsidies for low-income people. Problems with that software continued Thursday, according to people familiar with the individual marketplaces. In addition to calculation problems, a portion of the software that determines eligibility for people signing up for coverage was making inaccurate determinations in test cases Thursday, one person familiar with the situation said. Developments this week suggest that for many Americans, Obamacare will not be worthwhile. The administration’s report on premiums claimed that insurance rates will be “lower than projected” — clever code for “premiums will go up by slightly less” than the 2009 Congressional Budget Office estimates. That’s far from the $2,500 premium reduction that Obama promised his health plan would deliver, during his 2008 campaign. While Obamacare may not be worthwhile for many Americans, implementing it certainly has been a problem — for both state exchanges and the federal government. Wednesday morning, The Wall Street Journal reported that Colorado, like Oregon before it, would delay online purchases of health insurance through its exchange; “some people will have to enroll by phone or in person” instead. Later Wednesday, the District of Columbia announced delays for its exchange; customers in the nation’s capital won’t be able to see what insurance subsidies (if any) they qualify for until at least November. Then on Thursday — even as President Obama was publicly claiming that Obamacare is “here to stay” — The Associated Press reported another series of delays, these postponing online sign-ups for both the federally run small business exchanges and the Spanish-language exchange. The combination of broken premium promises, limited access to care and continued implementation failures all send one clear message: Congress should stop Obamacare before it starts, and focus on common-sense solutions that can reduce health care costs for all Americans. With just six days before the Obamacare insurance exchanges open, news of glitches and delays abounds. Colorado became the second state, after Oregon, to limit the ability of residents to enroll online in its state-run exchange in the first weeks, saying some people will have to enroll by phone or in person for about a month until glitches are ironed out. In other words, for its grand opening next week, Colorado will rely on old-fashioned pen-and-paper applications for individuals interested in qualifying for coverage. The exchange implementation failures have not been isolated, nor have they been limited to states. The Wall Street Journal reported in the same article yesterday that, “in another sign of the technical challenges” facing Obamacare, federally run exchanges in 33 states will not be able to sign applicants up for Medicaid coverage directly; instead, individuals will be sent to the state Medicaid agency to start the application process over again. The Obamacare exchange serving Washington, D.C. is delaying important parts of its operations less than a week before it is scheduled to open for enrollment. Washington’s exchange said Wednesday that it will not be ready on Oct. 1 to calculate the tax subsidies people can receive to help purchase private insurance. The D.C. exchange also will not immediately be able to determine eligibility for Medicaid. So if you live in the District and qualify for exchange subsidies, the exchange won’t be able to determine what subsidy you’ll receive, and what you’ll actually pay for coverage—and if you think you might qualify for Medicaid, the exchange won’t be able to help you at all. All these technical headaches might be enough to cause some Obamacare implementers to seek some “Obamacare” themselves. But the real headache will soon be facing the American people if Congress does not stop an increasingly unworkable law. Last week’s release of the annual long-term budget outlook by the Congressional Budget Office (CBO) illustrates the need to control federal spending, and spending on health entitlements in particular. One chart from the report explains why the Medicare Part A trust fund could “be exhausted just beyond the coming decade,” according to CBO. Figure 2-4 demonstrates in visual form that the level of Medicare benefits being paid out vastly exceeds the taxes being paid into the system. Over their lifetime, beneficiaries born in the 1940s would, on average, receive about $160,000 in benefits (net of premiums paid) and pay about $45,000 in payroll taxes (both figures are expressed in 2013 dollars). 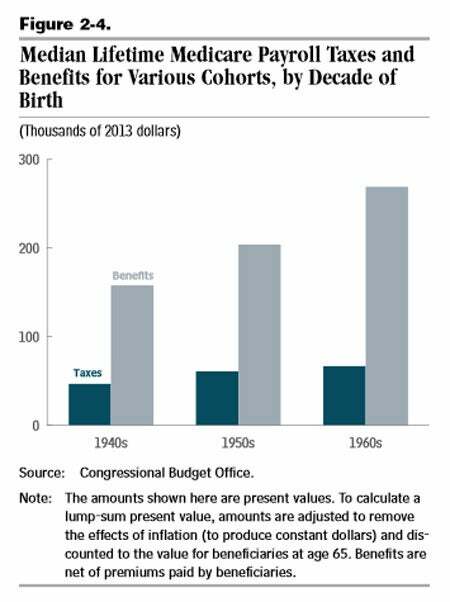 Those born in the 1950s would receive, on average, about $205,000 in benefits and pay about $60,000 in payroll taxes, CBO estimates. And those born in the 1960s would receive, on average, about $270,000 in benefits and pay about $65,000 in payroll taxes. That drawback notwithstanding, the CBO chart confirms prior Heritage analysis: The Medicare benefits most baby boomers are projected to receive vastly exceed the amount of taxes being used to fund the program. That fact, coupled with the growth in projected benefits for current and future generations of beneficiaries, illustrates why Medicare needs structural reforms in order to make the program sustainable in the long term. Today the Department of Health and Human Services (HHS) released a report regarding premiums and plan offerings in Obamacare’s exchanges for next year. Despite the Administration’s claims, premiums are going up due to Obamacare—and the quality of the “coverage” is, in many cases, going down. In both today’s report and an earlier report released in July, HHS claims that premiums are “lower than projected.” HHS bases its claim on a March 2012 Congressional Budget Office (CBO) estimate stating that premiums for a family would average $15,400 per year on the exchanges. The Administration report claims that weighted average premiums are “16 percent below projections” based on that CBO report—therefore Obamacare is lowering premiums. What HHS didn’t mention is that CBO also estimated in a November 2009 analysis that individually purchased insurance premiums would go up by an average $2,100 per family, due to the increased mandates and requirements included in Obamacare. So when HHS says that premiums are “below projections,” it really means that premiums are still going up as a result of Obamacare—just by less than originally advertised. That’s a far cry from candidate Obama’s promise that his health plan would lower premiums by $2,500 per year. So instead of just raising premiums, Obamacare is inflicting a double whammy: forcing the American people to buy health plans costing more than what they paid previously, and providing such limited access to provider networks they may not be able to find a doctor that will treat them. It’s why Congress should act now to stop Obamacare before it starts. Federal officials often say that health insurance will cost consumers less than expected under President Obama’s health care law. But they rarely mention one big reason: many insurers are significantly limiting the choices of doctors and hospitals available to consumers…. Just as a Los Angeles Times article last week documented, consumers may hear the words “the doctor can’t see you now…a lot more often after getting health insurance under” Obamacare. To limit the skyrocketing growth of premiums due to the law’s new mandates, insurers are sharply restricting their physician networks. Patients could face the choice of giving up their established doctor and traveling long distances to find a new doctor or hospital in their insurance company’s provider network—or paying significantly more to see a more convenient and accessible doctor on an out-of-network basis. Supporters of Obamacare like to call the law the “Affordable Care Act.” But as the Times reports this morning, that label presents a contradiction in terms—because under Obamacare, the “coverage” will likely give little access to actual health care. When this partisan law was rammed through more than three years ago, its backers publicly stated they could not bother to read the legislation—or give the American people time to read the bill. “We have to pass the bill so that you can find out what’s in it,” as the former Speaker of the House famously remarked. The people who passed Obamacare didn’t listen to the American people—because, as polling since Obamacare passed has demonstrated, the American people don’t like the law one bit. All the reasons people don’t like Obamacare are the same reasons we need to stop its implementation—to prevent premiums from going up; to prevent massive new tax hikes; and to prevent people from losing their health coverage, or losing their jobs altogether. Listening to the American people about stopping Obamacare should not be a partisan exercise. Real people have already been harmed by this misguided law. Every day brings new facts to light on how Obamacare will raise costs on struggling families, restrict access to doctors and plans they like, increase our debt, and damage our fragile economy. Congress should work together to protect American families from being hurt and instead work on commonsense reforms that expand health care choices and lower costs. Today, the House of Representatives voted to stop Obamacare because it listened to people across the country. Here’s hoping the Senate listens to the American people as well. This post was originally published in The Daily Signal. Health and Human Services Secretary Kathleen Sebelius is already claiming that seniors would be adversely affected by House-passed legislation defunding Obamacare. Nothing could be further from the truth. Obamacare is the program inflicting harm on seniors—because, as Nancy Pelosi said, the law “took half a trillion dollars out of Medicare” to fund Obamacare. Defunding the law would make seniors much better off. to develop and engage in experiments and demonstration projects…to determine whether, and if so which, changes in methods of payment or reimbursement…would have the effect of increasing the efficiency and economy of health services…through the creation of additional incentives to these ends. In other words, Secretary Sebelius would have all the authority she needs to preserve the Medicare Advantage program, provided she wishes to use it. CBO and JCT assume that the Administration will interpret that [defunding] provision in conjunction with other statutes (including Public Laws 111-148 and 111-152) to give maximum effect to all laws wherever possible. It’s important to note that, both in 2011 and 2013, CBO has not said that defunding Obamacare would cause Medicare Advantage enrollment to plummet, or the program to end. That’s because CBO assumes that HHS will use its existing authority to keep the Medicare Advantage program up and running—unless Secretary Sebelius wants to score political points by taking benefits away from seniors. Second, Secretary Sebelius claims that Medicare “beneficiaries could have tremendous difficulty finding a doctor or experience delays in their care” if Obamacare is defunded. The truth, however, is that seniors will have difficulty finding access to care if Obamacare is NOT defunded. Non-partisan actuaries in the Secretary’s own department said that, within a decade, 15 percent of hospitals could become unprofitable due to Obamacare, and “might end their participation in the program, possibly jeopardizing access to care for beneficiaries.” If Secretary Sebelius is worried about beneficiaries’ access to care, she should support defunding Obamacare, not oppose it. Secretary Sebelius’s letter may be intended to score political points, but it’s simply not accurate. Moreover, when it comes to seniors, the greater threat lies not in defunding Obamacare, but in allowing it to take effect. Less than two weeks before the launch of insurance marketplaces created by the federal health overhaul, the government’s software can’t reliably determine how much people need to pay for coverage, according to insurance executives and people familiar with the program…. Four people familiar with the development of the software that determines how much people would pay for subsidized coverage on the federally run exchanges said it was still miscalculating prices. Tests on the calculator initially scheduled to begin months ago only started this week at some insurers, according to insurance executives and two people familiar with development efforts. Less than two weeks before the exchanges “go live,” officials at the Department of Health and Human Services (HHS) are months behind schedule and scrambling to “fix” the software that will run exchanges in 36 separate states. In other words, 11 days before the October 1 launch date, HHS still doesn’t know if the exchanges will work—if individuals will be able to see how much their insurance options will cost them. The Journal’s report reveals multiple ironies. First, HHS has released multiple reports in recent months claiming that Obamacare coverage will be “affordable”—yet its systems still can’t determine what people will actually pay for their own insurance policies. Second, HHS did not disclose these “glitches” to Congress in recent weeks. The contractor developing the federally run exchanges testified before the House Energy and Commerce Committee last week, and the head of the HHS office in charge of exchanges testified before the same committee on Obamacare implementation just yesterday. Neither official mentioned the massive pricing “glitch” in their statements to Congress—a far cry from the transparency candidate Obama promised when he pledged to hold health care negotiations on C-SPAN. Regardless, it’s once again clear that given the series of implementation failures and glitches, Obamacare is not ready for prime time—and never will be. It’s why Congress should act now and refuse to spend a single dime on this unworkable law.